First there was Air France flight 447, and then, Malaysia Airlines flight 370. They were there, and then they were gone. MH 370 made no distress call, there were no signs of technical malfunction or engine failure, and the weather was just fine. But, somewhere over the Andaman Sea, something had gone horribly wrong. So how does one “lose” an airplane? The media has struggled with the notion that a passenger-carrying commercial aircraft could go missing without a trace. Those in the aviation industry however, were not entirely taken aback. Air transportation has had a thorn in its side since the times of Earhart and Lindbergh: aircraft beyond line-of-sight over the ocean are impossible to track in real-time. What is more, aircraft flying routes across vast sections of Africa, South America, and assorted regions of rugged or inhospitable terrain, are also outside the range of terrestrial surveillance. Canada’s north is no stranger to this issue. Long-haul flights routinely cross over the Yukon, Northwest Territories and Nunavut on polar routes between hubs such as New York and Los Angeles and destinations in Asia and the Middle East. For decades, much of the Arctic was beyond the scrutiny of air traffic control scopes. Controllers would use grease pencils and charts to plot routes between navigational aids. Conservative non-radar separation standards, based on pilot position reports and controller-computed estimates, were applied. However, air traffic services in the north began to evolve with the introduction of ADS-B. Throughout the Arctic and Hudson Bay, ADS-B technology is providing information similar to radar through GPS-based surveillance. This has led to substantial gains in safety and efficiency in the northern control areas. By upgrading to ADS-B, air traffic control agencies are trading up on a technology that has not fundamentally changed since the 1950s. ADS-B provides superior surveillance capability, with far greater accuracy than radar ever could. 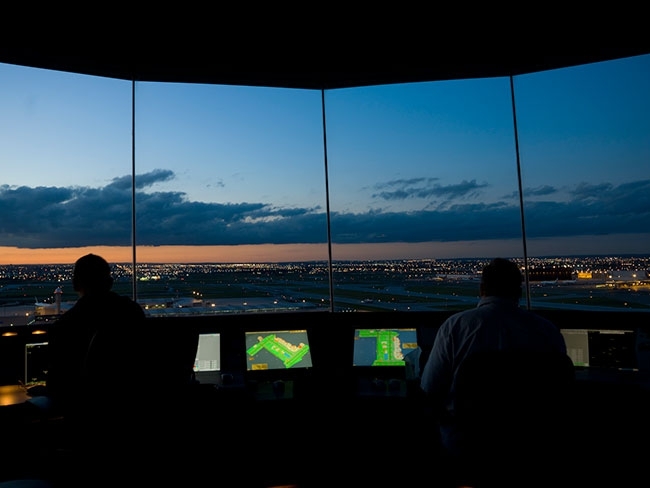 In fact, the U.S. Federal Aviation Administration (FAA) has mandated that all commercial aircraft be ADS-B compliant by June 1, 2020, as part of its air traffic control modernization strategy. However, ADS-B, in its current incarnation, is limited to regions of the world where a network of ground antennas can be installed and maintained. This can be impossible in some places, and prohibitively costly in others. So, in leaving out the applicable remote, mountainous and oceanic parts of the globe, air traffic control is effectively blind to 75 to 80 per cent of the world’s navigable airspace. But that’s all about to change. Instead of looking up at aircraft, ATC is going to start looking down. Don Thoma, CEO of Aireon LLC and a former U.S. Air Force Captain, was working in corporate development for Iridium Communications Inc., a Virginia-based satellite communications company, as they were planning for their next-generation satellite constellation. “We were looking at ways to leverage what turns out to be an incredible communications architecture,” he says. “Iridium NEXT” is an interconnected network of 66 cross-linked Low Earth Orbit satellites set to launch between 2015 and 2017. While Iridium is not innately linked with aviation, Thoma explains that the concept of providing global air traffic surveillance was a “serendipitous find” by a colleague who was attending a conference on ship tracking. It appeared that a joint venture would be a benefit to both parties. “They manage one of the busiest remote air traffic corridors in the North Atlantic,” says Thoma of NAV CANADA. “Their whole corporate structure is built around providing efficiencies to their airline customers.” Within six months, a deal leading to the creation of Aireon was put in place, with NAV CANADA as the lead investor and eventually including three other ANSPs from around the world – ENAV of Italy, the Irish Aviation Authority (IAA) and Naviair of Denmark. While the wheels at Aireon have been steadily turning, calls for a global tracking service are coming increasingly fast and furious. A report by the International Air Transport Association (IATA), released in November 2014, highlighted the risk to public confidence if large and modern aircraft continued to go missing. The IATA has emphasized that they would prefer a “performance-based approach to tracking,” allowing airlines to steer clear of additional equipage requirements. Along those lines, the IATA’s Aircraft Tracking Task Force has recommended that aircraft should transmit information on their position, track and altitude at least every 15 minutes in areas where air traffic control surveillance is unavailable. With aircraft routinely clocking more that 900 km/h over the ground, a 15-minute window leaves rescue workers facing a daunting search effort, should something go wrong over rough terrain or water. As tracking can, unfortunately, end up being more about providing answers after accidents as opposed to actually preventing them, there is a delicate calculus to be conducted in balancing the eventualities of locating a rare, lost aircraft versus investments that make tangible improvements to safety and efficiency. While ICAO’s 12th Air Navigation Conference in 2012 recommended extending surveillance through satellite-based ADS-B, Thoma emphasizes that airlines would “balk” if required to make any additional investments beyond what they had already put in place. In the wake of MH370, and the calls for aircraft tracking to be improved, Aireon and NAV CANADA announced the creation of the Aireon Aircraft Locating and Emergency Response Tracking service, dubbed Aireon ALERT. The fundamental business model of Aireon will be to provide real-time surveillance capabilities that will improve safety and efficiency for air traffic control. “It won’t require additional investment by ANSPs who are already customers of Aireon services,” says Thoma. Currently, five ANSPs are signed on as subscribers including NAV CANADA, ENAV, the IAA, Naviair and NATS of the U.K. Crichton says that Aireon is currently in positive discussions with at least 10 other interested ANSPs. Aireon anticipates the performance of the space-based system to be at about the same level as terrestrial ADS-B. However, the rollout will involve extensive operational readiness testing. “We will launch two satellites that will validate the technical performance of the system,” says Thoma. This, in turn, will lead the way for a steady train of seven launches. It is expected that the entire constellation will be in orbit by the end of 2017. NAV CANADA has slated the North Atlantic to be the first deployment for space-based ADS-B. According to Crichton, 96 per cent of aircraft operating on the North Atlantic Tracks are already equipped for the service. The plan is to start by reducing the longitudinal separation standards on the North Atlantic Tracks from 80 nautical miles (10 minutes) to 15 nautical miles. Conservative estimates predict that, in the first year, airlines will save at least $125 million in fuel costs over the North Atlantic alone. This will also cut roughly 328,000 metric tons of CO2 emissions every year simply as a result of more aircraft being allowed to climb to their optimum cruising altitudes. From there, the service will expand to providing global coverage. Separation standards will be reduced, and radar-like surveillance will be available worldwide. Areas that were once hidden from land-based systems will be subjected to comprehensive, real-time coverage. So, too, will the aircraft flying in the airspace above them. Once the full benefits of Aireon are realized worldwide, initial projections are that airlines will save $500 million to $1 billion in fuel costs annually. “There are no implementations either in process, or planned, that could do what Iridium does and what Aireon will do on top of that,” says Thoma. While global tracking has been garnering much of the media’s attention in recent times, there is a significant difference and corresponding safety benefit between tracking and surveillance. Tracking makes aircraft easier to locate, but there are innumerable safety benefits that come with radar-like surveillance. These include flexibility in routing, deviations, altitude and speed adjustments, as well as situational awareness in reference to other aircraft. If there is one constant in the world of aviation, it is technological change. The range and carrying capacity of modern passenger aircraft has dramatically increased, with the daily growth of the demand for air travel. So too has the pressure placed upon ANSPs to manage increasingly congested airspace. Space-based ADS-B could be a game changer. “Aireon literally solves the problem in the most effective way,” says Crichton, highlighting the benefits of radar-like coverage from pole-to-pole. With oceans and remote areas of the world no longer blind spots to air traffic surveillance, Aireon could make lost aircraft a thing of another era, removing the thorn once and for all. In concurrence with the high-profile global tracking issues discussed at the ICAO High Level Safety Conference in February, Aireon LLC made two significant announcements. The first was that the Aireon ALERT service will be managed from the Irish Aviation Authority’s (IAA) North Atlantic Communications Centre in Ballygirreen on the West Coast of Ireland. “Aireon ALERT offers precisely the kind of service currently being sought after by the International Civil Aviation Organization, the International Air Transport Association , airlines and other aviation bodies to help locate missing aircraft as fast as possible,” said Eamonn Brennan, Chief Executive of the Irish Aviation Authority. Secondly, at the sidelines of the conference, Aireon signed a Memorandum of Agreement with the Civil Aviation Authority of Singapore to enhance aircraft tracking in the Singapore Flight Information Region (FIR). This includes evaluating the requirements of the region and developing the needed policies to improve and harmonize the efficiency of air traffic management services in the Singapore FIR. Currently, some parts of the Singapore FIR are not under surveillance coverage, such as remote areas and over the oceans.